Addo Elephant National Park’s three lion cubs which rose to fame towards the end of last year,orphaned when their mother, Gina, died, have started the next step towards their rehabilitation back into the wild. Now nine months old, the male and two females were moved from a holding boma in the park’s main game viewing area to a much larger, 200 hectare camp within the Kuzuko contractual area in the north of the park. Estimated to be weighing about 80kg each, they have the freedom to explore and start hunting small animals for themselves. “They will be closely monitored by Kuzuko management on a daily basis as it may be necessary to supplement their diet until such time that they are able to hunt on their own. 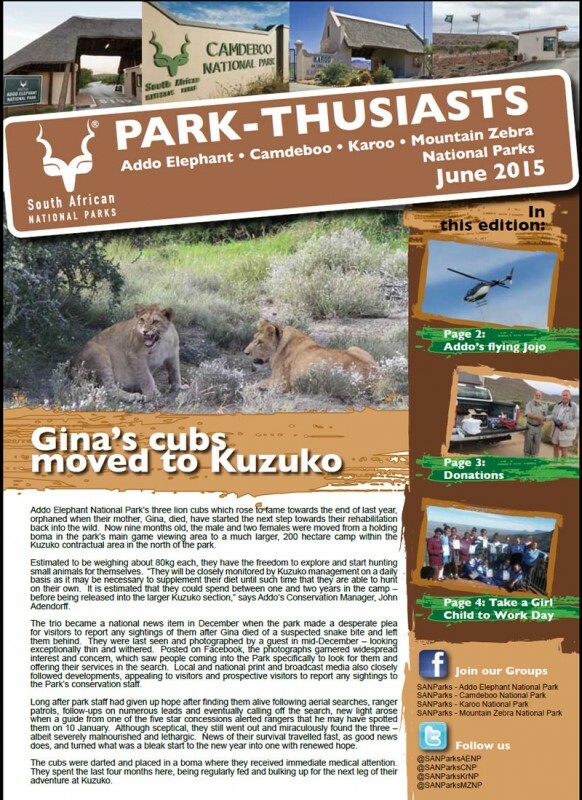 It is estimated that they could spend between one and two years in the camp – before being released into the larger Kuzuko section,” says Addo’s Conservation Manager, John Adendorff. The trio became a national news item in December when the park made a desperate plea for visitors to report any sightings of them after Gina died of a suspected snake bite and left them behind. They were last seen and photographed by a guest in mid-December – looking exceptionally thin and withered. Posted on Facebook, the photographs garnered widespread interest and concern, which saw people coming into the Park specifically to look for them and offering their services in the search. Local and national print and broadcast media also closely followed developments, appealing to visitors and prospective visitors to report any sightings to the Park’s conservation staff. Long after park staff had given up hope after finding them alive following aerial searches, ranger patrols, follow-ups on numerous leads and eventually calling off the search, new light arose when a guide from one of the five star concessions alerted rangers that he may have spotted them on 10 January. Although sceptical, they still went out and miraculously found the three – albeit severely malnourished and lethargic. News of their survival travelled fast, as good news does, and turned what was a bleak start to the new year into one with renewed hope. The cubs were darted and placed in a boma where they received immediate medical attention. They spent the last four months here, being regularly fed and bulking up for the next leg of their adventure at Kuzuko.